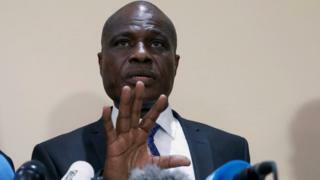 Opposition presidential candidate Martin Fayulu has warned election officials in the Democratic Republic of Congo not to "disguise the truth" as tensions mount over the delayed result. Mr Fayulu said the "Congolese people already know" the result of the vote, which took place on 30 December. The election outcome was initially expected to be announced on Sunday. The poll is to establish a successor to Joseph Kabila, who is stepping down after 18 years as president. Mr Kabila has promised that the polls, which were supposed to have taken place two years ago, will be DR Congo's first orderly transfer of power since it gained independence from Belgium in 1960. His preferred successor, former interior minister Emmanuel Shadary, is facing strong opposition from Mr Fayulu, an ex-oil tycoon, and Felix Tshisekedi, son of a veteran opposition leader. On Tuesday, Mr Fayulu said DR Congo's National Electoral Commission (Ceni) must "publish the provisional results of the presidential election in the near future," adding: "The election results are not negotiable." The head of the electoral commission, Corneille Nangaa, earlier said that the results from a number of polling stations still needed to be counted. Mr Nangaa, who has given no date for when provisional or final results would emerge, has said people need to be patient amid rising tensions over the delay. Meanwhile the influential Catholic Church, which deployed 40,000 observers during the vote, said that it knows who won the election. Its statement has been condemned by officials in Mr Kabila's government. After last month's vote, internet and text-messaging services were shut down nationwide in a move that the government said was necessary to guard against the spread of unofficial results. Last week, US President Donald Trump announced that 80 troops had been sent to nearby Gabon because of the "possibility that violent demonstrations may occur" following DR Congo's vote. They would be deployed if needed to protect US citizens and diplomatic facilities in DR Congo's capital, Kinshasa, he said. Martin Fayulu: The ex-oil tycoon - worked for Exxon Mobil for 20 years and entered politics in 2006. He is known as the "people's soldier" for leading protests against President Kabila. Emmanuel Shadary: Kabila's 'hardline' choice - an ex-interior minister who is under EU sanctions for alleged human rights violations in deadly crackdowns on protests. His ruthless reputation has earned him the nickname "Make It Happen". Felix Tshisekedi: The man trying to outdo his father - son of late veteran opposition leader Etienne Tshisekedi, he has promised to make the fight against poverty his priority. Backed out of an opposition deal to have a unity candidate and ran on his own ticket with the backing of politician Vital Kamerhe.